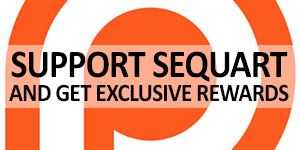 Sequart Organization is going sci-fi in a big way! With the success of our Star Trek book, we’re proud to announce that work has commenced on three Star Wars books and two Planet of the Apes books. 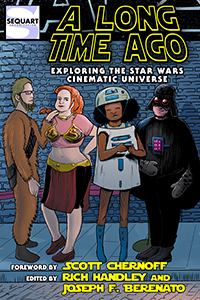 First up will be 2015’s A Long Time Ago: Exploring the Star Wars Cinematic Universe: Edited by Rich Handley and Joseph F. Berenato, this book will examine the entire big- / small-screen saga that is Star Wars. From theatrical films to TV movies, from cartoons and commercials to variety shows and video-based amusement-park rides, the mythos continues to keep audiences glued to their seats. This anthology features insightful, analytic essays about the franchise’s long history from popular film historians, novelists, bloggers, and subject-matter experts, exploring why the films proved so immediately popular, where the movies and TV shows have succeeded and faltered, and why we all keep going back for more. Next will be 2016’s A Galaxy Far, Far Away: Exploring Star Wars Comics: Editors Joseph F. Berenato and Rich Handley pick up where their previous volume left off. Over a thousand comics have been produced from a variety of publishers, including Marvel Comics, Blackthorne Publishing, the L.A. Times Syndicate, Dark Horse Comics, Scholastic, Tokyopop, and more. They’ve spanned the history of the franchise, from millennia before Anakin Skywalker’s birth to beyond Luke Skywalker’s death, and they’ve focused on every aspect of the Star Wars Universe. 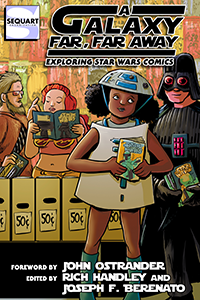 This anthology features insightful, analytic essays examining the Star Wars comics, written by popular comic historians, novelists, bloggers, and subject-matter experts — plus, a foreword by fan-favorite Star Wars comics writer John Ostrander. 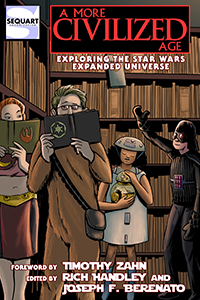 From Jaxxon to Cody Sunn-Childe, from Ulic Quel-Droma to Lady Lumiya, find out how comics helped to keep the Star Wars Universe alive, and why you’re missing out if you’re not reading them. Finally there’ll be 2017’s A More Civilized Age: Exploring the Star Wars Expanded Universe: More than 250 Star Wars novels have been published by Del Rey, Bantam Books, Ballantine Books, and others, aimed at both young and adult readers. Spanning the decades before, during, and after the films’ events, the books have spawned new galactic governments, explored the nature of the Jedi and the Sith, and developed the Star Wars mythos well beyond merely a series of films and television shows. Editors Rich Handley and Joseph F. Berenato complete their trilogy with a look back at not only the Star Wars novels but also video games, radio shows, role-playing games, and more. This volume offers insightful, analytic essays examining the Star Wars E.U., written by popular film historians, novelists, bloggers, and subject-matter experts — including fan-favorite Star Wars novelists Timothy Zahn and Ryder Windham. The films were just the beginning; find out how the universe expanded. 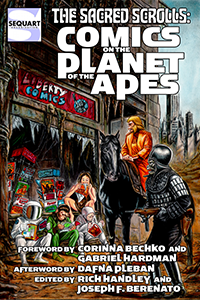 Coming out in just a few months will be The Sacred Scrolls: Comics on the Planet of the Apes: More than 150 POTA comics have been published during the past four decades, from Gold Key, Marvel Comics, Power Records, Brown Watson Books, Editorial Mo.Pa.Sa., Malibu Graphics, Dark Horse, Mr. Comics, and BOOM! Studios. Writers have explored the settings, concepts, and characters from the films (and occasionally the TV series), while introducing an array of new characters and scenarios. Back stories have been revealed, plot holes filled in, and histories extrapolated upon. 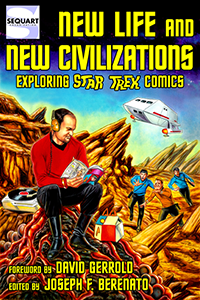 The comics have employed multiple genres and styles, taking readers to distant villages, ruined cities, and oceanic civilizations — and have even seen the apes battle alien invaders from War of the Worlds and Alien Nation. It’s been quite the madhouse, to be sure. But by and large, the Apes comics have remained true to novelist Pierre Boulle’s simian spirit. This anthology will feature insightful, analytic essays about the franchise’s four-color continuation, from popular comic historians, novelists, bloggers and subject-matter experts. 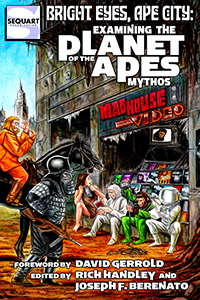 And 2016 will see Bright Eyes, Ape City: Examining the Planet of the Apes Mythos: The Planet of the Apes franchise has spawned eight films, with a ninth currently in the works, as well as two television series and several novels. It’s one of the most respected franchises in film history. This anthology will examine every Apes film, TV show, and novel, from 1968 to present. Like the first volume, this anthology will feature insightful, analytic essays about the franchise’s long history, from popular film historians, novelists, bloggers, and subject-matter experts. If you’re eager to learn more about Apes lore, then you’ll need to get your stinkin’ paws on this book. Spread the word about the new home of sci-fi analysis! Tagged Planet of the Apes, Sequart site news, Star Trek, Star Wars. Bookmark the permalink.